Leftovers and oddments (it’s really a word, look it up); discarded structures and memories: these are the conceptual foundations of Alison Frey Andersson’s paintings and objects. In 86’d, on view at c.nichols project, opening on May 31, Frey Andersson’s torn remnants of dyed canvas are fashioned into a meditation on painting. These materials surpass and puncture the picture plane, yet still maintain an abstract directive within non-representational painting. All while referencing nostalgia both at-hand and simultaneously keeping it at bay. Contemporary romantic surf-and-seafaring language of the titles, i.e. Closeout 1, Break Deep and A Place to Sleep, embroider a chronicle of an ultimately humbling experience of the sea. Mason twine and Mylar seep into canvases dyed with deep organics indigo, hibiscus and turmeric. While exploring the language of painting and what a painting can be, Frey Andersson references the natural world within the context of urban living, specifically, in Los Angeles. The results from these examinations range from recordings of indigo waves on paper to furniture remade from scavenged materials, in the tradition of Arte Povera. Alison Frey Andersson was born in Chicago in 1972. She received her MFA from the School of the Art Institute in 2002 and her BA from the University of Oregon in 1995. Recent exhibitions include Abstraction (Sound and Vision) curated by Joey Kotting at Todd Madigan Gallery Cal State Bakersfield, works on paper inc. greatest hits and selected b-sides at c. nichols project and Potluck at Country Club Gallery, Los Angles. She is represented by c.nichols project. 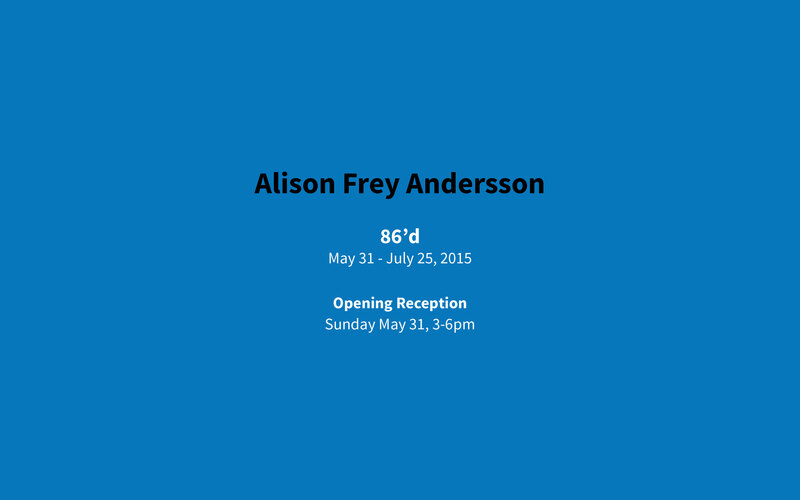 Alison Frey Andersson currently lives and works in Venice, California. For additional information and press inquiries please contact Christine Nichols or Justin Cavin at the gallery: info@cnicholsproject.com. c.nichols project is open Tuesday through Saturday from noon-6pm. Please check the gallery website for details and additional programming or call 310-915-1930 during gallery hours.